Never had I finished reading a novel and was immensely satisfied as when I finished the last novel that I read. I was reading Fieldwork, which happened to be the first novel of Mischa Berlinski. And I was very satisfied reading this one. Fieldwork tells the story of a Dutch anthropologist who happened to have murdered a missionary in the hills of northern Thailand, which is narrated through the eyes of an investigative journalist, who happens to be the author himself. Like the book I read before this, the author is also a character in this novel. But unlike the previous one, I found this one more believable. Somehow, being an investigative journalist is a more believable role than a killer and thief of medieval manuscripts. Anyway, so the story starts by having the author hearing about a Dutch anthropologist who was imprisoned in the Thai prison. He contacts the prisoner, and then later establishes a correspondence, but sometime afterward, the prisoner commits suicide. Thus, there starts the mystery of the Dutch anthropologist turned murderer turned corpse. The journalist investigates, starting from the university that the woman attended in the United States, interviewing former professors in the anthropology department, former roommates, former boyfriends, and other people. Slowly, the book reconstructs the adventures of Martiya van der Leun, an anthropologist who initally went to Thailand to study an indigenous group, but ended up settling with them for a long time, until the tragic events of her killing a missionary. I do not want to give away the details, since doing so might impede the efforts of other readers of fully appreciating this novel. However, I suppose I was able to identify with the main character of the story, and therefore I enjoyed this novel. Martiya van der Leun was a Third-Culture Kid; he was raised by his father, who was also an academician, in a culture apart from his own, thus forming one's own culture. Martiya grew up in an ethnic village in Asia, and therefore could converse fluently in the local tongue. The novel tackles issues of religion in society, as Martiya grows to appreciate the native culture of the Dyalo, while battling efforts of a family of missionaries, whose life-long goal was to convert the Dyalo from animism to Christianity. When the clash hit climax, she snapped and therefore killed David Walker, one of the missionaries. It made me think, how cultures are different, how cultures have their own religious belief system. The Dyalo in the novel believed that spirits of nature provide them with food, a good rice harvest, healthy children, among others. If one experiences a flood, then they think that they have angered the spirits. If they have a bad harvest, then they must have angered the rice spirit. Then comes the Christians in the book, who tells them that they can be set free from slavery, that they do not have to please the nature spirits anymore, because all they need to do is to believe in Jesus, and they would be saved. But come to think of it, the missionaries only substituted one mystical belief system with another one. I mentioned earlier that different cultures have different belief systems. But if one steps back and looks at the bigger picture, there are some universal traits. These belief systems, whether one believes in the nature spirits or in the Christian god, these are just Man's attempt in explaining the things around him, that are otherwise unexplainable. There used to be a time in which people believed that they got sick because of bad luck. They thought that they became sick because they displeased the spirits or some god. However, with the discovery of microbes and viruses, these beliefs were obliterated. Still, I do acknowledge that there are still things around us that cannot be explained. That's why the belief in a supernatural being tends to be universal. Humans just want an explanation. Anyway, I never really do this, but for this book, I wrote the author a note of appreciation. Ha! I suppose that's the first time I sent fanmail. So I returned that book to the library, and now I am starting on another one. This one is called The Spanish Bow, by Andromeda Romano-Lax. 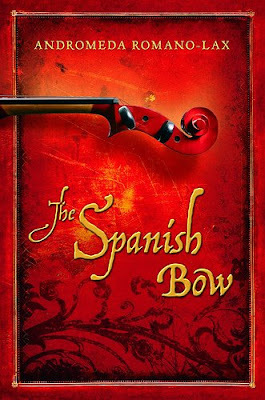 It is set in Spain, and it apparently is about a cellist. That's what I know so far.